Gina Neely – Only Gina! Super Bowl party dips: Skillet pepperoni pizza dip and cheddar cheese fondue. When You Dip, I dip, We dip. It’s finally here. And it could not be on a more fitting day. A day of Thanksgiving. It’s been such a labor of love. I wrote this book not only for myself, but for anyone else who might find themselves in a transition. It’s amazing how things can change, sometimes over a long period of time and other times very quickly. Regardless of how things change or when things change, we must adapt. I pray that the pages of this book encourage you and inspire you to keep believing, keep loving, and keep fighting. For those of you who have already preordered the book, I am so grateful for you. Thank you for believing in me and my vision. I will have your book autographed and shipped to you. Life is so very precious. And as I approached a milestone birthday I decided to implement the necessary measures to “Take My Life Back” and embrace the time I have left by living an authentic life. No one desires to experience heartbreak or the revolving issues of life, but once life happens we somehow muster up the inner strength to power through. It’s my heart’s desire that this book helps you to “Get Your Life Back!” I am ready for what life has to offer and I want you to get ready too. Come take a ride with me and let’s enjoy the ride together. Gina Neely burst onto the scene in 2008 by starring in the hit show Down Home with the Neelys, which became the highest-rated series debut in the history of Food Network’s “In the Kitchen” block. The show immediately connected with viewers nation-wide by showcasing Gina’s love for family, food and the enjoyment of life. Following the tremendous success of her television show, Gina released her first cookbook, Down Home with the Neelys, which quickly earned a place on The New York Times bestseller list. A hit show and a bestseller soon lead to Gina’s prime time television debut as the host of Food Network’s Road Tasted. Enjoying continuing success in television, 2011 proved to be a tremendous success for Gina with the release of a second book, The Neely’s Celebration Cookbook. As a top rated television personality and best-selling author, Gina has performed live for thousands of fans all over the country, not only showcasing her skills and fun loving approach to cooking, but also sharing her perspectives on life, love, and the issues facing women in their personal and professional lives. 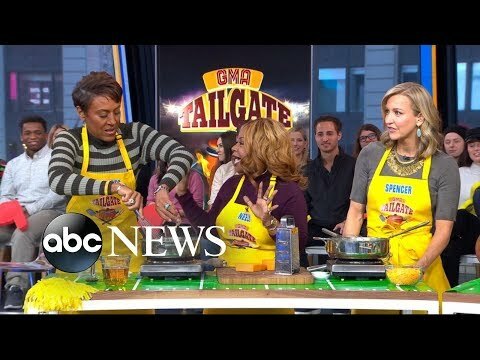 Harry’s cooking up a quick and easy Thanksgiving meal with chef Gina Neely. As a top-rated television personality and best-selling author, Gina has performed live for thousands of fans all over the country. Here you will experience a bit of her journey and her determination as she embraces the fullness of life.